Living in a period property doesn't mean you have to stick rigidly to the original layout of your home. These days, modern living is all about light, space and spending time together, and increasingly we're cooking, eating and relaxing all in the same open plan space. Victorian homes that once would have been a warren of small, gloomy spaces can be reconfigured surprisingly easily into practical and spacious multipurpose rooms. The resulting open plan spaces are often kitchen diners, sometimes incorporating some living space with sofas and armchairs too. And just because combining spaces like this is a more contemporary approach that doesn't mean you have to banish the traditional look – open-plan areas can look just as good with antique or vintage furniture. Here are some of our favourite traditional open plan room design ideas – perfect inspiration if you're planning a switch to spacious, multipurpose living space. A word of caution though, if your home is listed you may need to get planning consent before you pick up the sledgehammer. Use our guide to creating an open plan layout in a period home to get more practical advice. In this converted Victorian chapel, originally built in the 1850s, the huge open plan kitchen, dining and living space has been designed so that all the equipment is tucked behind tall Shaker-style cupboards so that nothing interrupts the uncluttered, elegant lines of the space. The hob is flush to the kitchen island with an extractor fan in the ceiling above. Off-whites and grey shades work well in a place where everything needs to feel harmonious and calm. Use our guide to creating an open plan kitchen diner to get a room that works for you. The owners of this Grade II listed Dorset cottage could make only minimal changes to their kitchen diner under planning restrictions, but adding just 10 square metres created sufficient space for a small seating area next to the French windows. A rustic farmhouse table, tongue and groove panelling, and simple kitchen units, handmade by the owner, are in perfect keeping with the humble cottage setting. See more clever ways to add a small extension to your home with our design gallery. This attractive L-shaped kitchen diner is a recent oak frame extension to a four-bedroom cottage dating back to the 1600s. The owner wanted a ski chalet look, so the long pine table and leather chairs from an antique shop, and bespoke window bench softened with sheepskin and piles of cushions are perfect choices. Find out more about adding an oak frame extension in our practical advice guide. With windows all round, the living-dining-kitchen in this dreamy Swedish island home is light, airy and makes the most of the wonderful coastal views. The working kitchen section of the room is at the back of the house, with garden views rather than sea views, and the cabinets, appliances and tiles are white so they fade into the background and keep the sense of space in the open plan room. Find out how to create a good flow in your open plan living space. This sleek kitchen diner was created in a side return extension to a Victorian townhouse and is now the hub of the home. It incorporates the kitchen appliances and cabinets, but also a bright dining space, island preparation area and even a small play space at the back of the room. The family are now able to spend more time together in this versatile space. Find out more about adding a side return extension in our guide; find out more about extending a Victorian house, too. 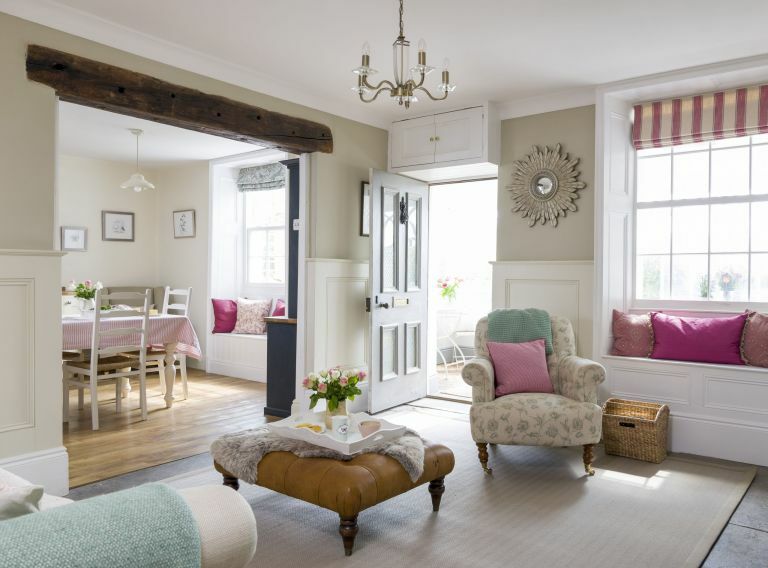 An exposed wooden beam frames the wide opening between the interconnecting living room and kitchen in this pretty Cumbrian cottage dating from 1800. A harmonious soft pastel colour palette is used in both sides of the divide to tie the two spaces together and keep the flow. Read more about removing internal walls before you proceed. Reclaimed parquet flooring and mix-and-match Mid-century and traditional chairs help the new kitchen dining room extension blend with the original Victorian home. The bright new space replaces a narrow galley kitchen that wasn't suitable for a growing family. Rooflights were essential to the extension's sunny look. A bench seat backs on to the kitchen island, marking the transition between the two sections of the room, along with the two different types of flooring – the parquet and original quarry tiles. The tall pine cupboard to the left of the Aga was part of the Victorian kitchen. Read more about choosing rooflights to ensure you make the right choice for your home. The homely kitchen diner in this 18th century croft cottage on the west coast of Scotland was created by removing an internal wall and then furnished on a very tight budget. The dining space has views of both sides of the garden, through new French doors at one end and the original window at the other. Open shelving in the kitchen section becomes part of the decor, along with practical blackboard cupboards. Find out more about creating a stylish kitchen on a budget in our guide. Summoning up the colours of the sea with sandy woods and blue-grey highlights, this versatile open-plan kitchen diner in a seaside home opens into the living room through glass doors. An antique pine armoire provides extra storage and a farmhouse table seats up to eight diners on chapel chairs. Bleached wood flooring completes the look. Looking for traditional open plan room design ideas for a sleep space? It's hard to imagine it being any different, but this spacious bedroom with its own sitting area (complete with cosy woodburner) and en suite bathroom is on the top floor of an old brewery building. The property was built in 1828 and is Grade II listed. When it was in use as a brewery, hops would have been hung to dry from the rafters in the room.